"Once upon a time," writes Matthew in The Annotated, "there was a Marx Brothers film called Duck Soup." Nobody disagrees with that, but we do find some points of contrast in this full-episode discussion about the Marx Brothers' greatest film, which is not their best work. Of course you know this means war! 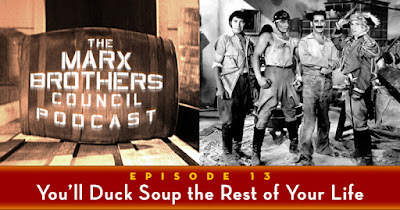 Official description: "This month we take a deep dive into Duck Soup, which Matthew acknowledges as one of his thirteen favorite Marx Brothers films. Bob fixates way too much on trivial moments, while Noah savors the early scripts way more than Leo McCarey did. By the end, we all reluctantly agree that the film is over…and so is Zeppo. Oh, and be on the lookout for a Ramones shout-out, a tie-in to Hogan’s Heroes, and a clip from a 1986 film." Note for early birds: When first released, new episodes may not appear at all of the below locations right away. If you click a link and see that Episode 12 is still the most recent one listed, try another, or be patient and it will appear everywhere -- and above all, don't worry. Many thanks to Mikael Uhlin for these materials! Visit Mikael's Duck Soup page here. Hail, hail Freedonia -- see you next month! Two things: 1) Is it me or in Duck Soup Zeppo is wearing a hair extension? 2) When Mrs. Teasdale speaks with Firefly on the phone, you can clearly see in his shots the shadow of a dark flag from the shooting with its stand. It's funny how obvious it is. Zeppo had been wearing a piece at least since Monkey Business. 3) The shot of Sylvania that appears before Trentino's conversation with the agitator is actually from a Spanish town: Loja, in Andalucia. Do we know where Freedonia's shot is from? Another fine podcast, gentlemen. I've always been a little prejudiced against Duck Soup, because it was the last Marx Brothers movie I got around to seeing, by which time I had it drummed into my head that it was THE greatest comedy movie ever, and when I finally did see it, I realized it wasn't THE greatest comedy movie ever. A very funny movie, yes, but far from what I'd been hearing about. Also, the automatic placement of Duck Soup in the top or close to top honors on lists of great comedy movies always annoys me, when I think it is clear that Animal Crackers, Monkey Business, Horse Feathers and probably A Night At The Opera are much funnier. Personally, Duck Soup always battles with The Cocoanuts and A Day at the Races on my list of Marx Brothers movies. That all being said, I could watch it right now and enjoy it immensely. As much as I like "Duck Soup", I would gladly trade it in for the Marxes in "Of Thee I Sing" and four other self-produced movies (with or without Zeppo), even if it meant a world without "Opera" or "Races". By the way, I'm the guy who owns the "Duck Soup" treatment. $25 well spent, although I'd part with it if the price were right. REALLY right.